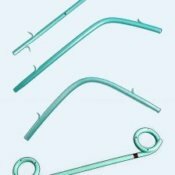 Biliary Drainage Stent is Used to endoscopically drain bile ducts. The teflon sleeve is used to collapse the proximal wing on the stent to aid introduction into endoscope channel mouth. Material choice- Radiopaque PTFE/Teflon OR PU. Packaging - Sterile peel open pack, single use.